Well today I finally recorded my audition CD for the Rome Festival this summer. If all goes well they will give me money and I will fly to Italy this summer. 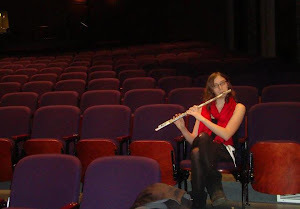 While there I would perform in multiple symphony concerts, be a part of a fully staged opera and ballet, and I would have the chance to perform in master-classes and in chamber ensembles with other members of the festival. Ages vary from pre-pubescent to octogenarians and members come from all over the globe. Did I mention it’s in Italy? Yeah. So I’m definitely crossing my fingers on that one. Which brings me to a thought: is it a good thing to keep ones expectations low, in order to not be let down? As I’m preparing my audition CD and thinking about the festival I can’t help but get excited (I mean, I’ve been wanting to travel abroad for years now, and this is finally the time and place for it). But then I also think that maybe I should keep this application to myself, not talk about the possibility of being accepted, and just in general pretend that nothing exciting is happening. If I do that and don’t get accepted then it won’t be as big of a deal…right? Well, no. I don’t think that’s the case. I definitely used to—I remember applying for graduate schools, auditioning for competitions, and just in general doing exciting and new things, and downplaying them so severely in my mind that (I was convinced) I wouldn’t be bothered if things didn’t turn out well for me. But really… who was I kidding? Besides myself obviously. I applied for graduate schools and would tell anyone that it wasn’t a big deal, that I’m just applying for these schools and that it really doesn’t matter to me. It’s as if the very thought that that other person would know that I was invested, excited, and terrified by something, well, terrified me. Why did we feel the need to cheapen our goals and ourselves by pretending they don’t matter? I know, I know, there are plenty of people out there that are arrogant, egotistical, self-serving, and attention whores, but that doesn’t mean that others have to be quiet, self-effacing, and overly modest about what’s going on in our own lives. It’s an attempt to not be hurt by bad news, rejection, failure…we pretend it doesn’t matter because it matters so much that not succeeding will cause pain. Humanity doesn’t do well with pain (unless you’re a masochist I suppose). I remember when I did not get accepted to my top choice music school last year. I got the letter, kept a stiff upper lip for about an hour or so and then broke down sobbing hysterically. I felt like I had failed life, not just been not accepted to a school. Pretending that it didn’t matter or wasn’t important beforehand had not prepared me for that blow. In fact it made me even less capable of handling it because everyone around me was confused—when you tell your friends and family that something doesn’t matter to you and subsequently freak out and have an emotional breakdown when that thing doesn’t go the way you had planned, they don’t quite understand how to respond. I’m not saying that everyone should run around wearing their emotions on their sleeves, incessantly blabbing about what they have going on in their lives to the point of exhausting and boring their friends and family to tears. What I am saying is that if something is exciting and important and meaningful to you… let someone know. If something is important to you it should be important to your friends and family. If it’s not, then something is wrong and you have other (more important) things to be worrying about. I’m excited for my opportunity to spend the summer in Rome. I hope that once I get there I will have time on weekends to travel to all sorts of different countries. I plan to make the most of the experience, meet new people, make new friends, and maybe even find or make a job for myself as a musician abroad. I will never get these opportunities if I don’t try, and I will never get the support of my friends and family if I constantly downplay these opportunities and pretend they don’t matter.